Hong Kong’s IPRI score increased by 0.064 to 7.849 placing it 5th in the Asia and Oceania region and 17th in the world. Hong Kong (Sar Of China) is classified by the IMF as part of the Advanced economies group and by the World Bank as High income country. Hong Kong’s Legal and Political Subindex decreased by -0.25 to 7.983 with scores of 8.520 in Judicial Independence, 8.390 in Rule of Law, 6.867 in Political Stability, and 8.154 in Control of Corruption. Hong Kong’s Physical Property R ights Subindex increased by 0.323 to 8.174 with scores of 8.629 in perception of Property Rights Protection, 9.097 in Registering Property, and 6.796 in Ease of Access to Loans. 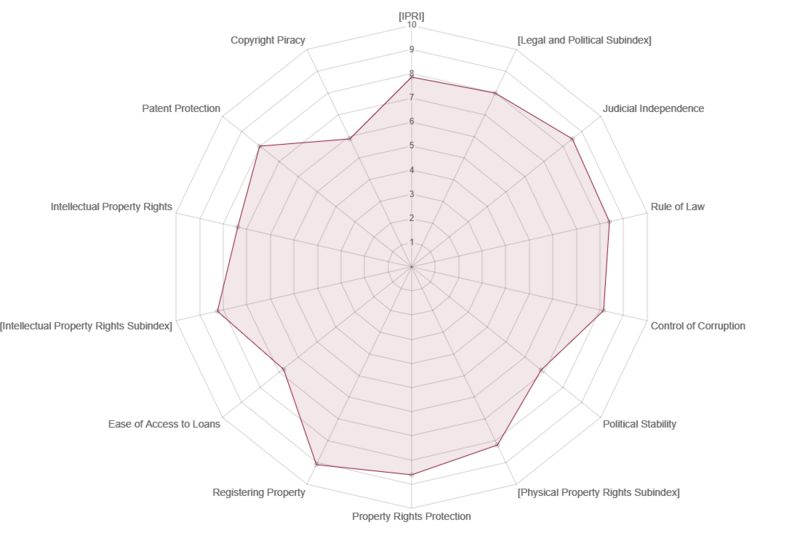 Hong Kong’s Intellectual Property Rights Subindex increased by 0.119 to 7.391 with scores of 8.239 in perception of Intellectual Property Protection, 8.033 in Patent Protection, and 5.9 in Copyright Protection.